In the world of craft beer we’re always on the lookout for the latest and greatest discoveries, whether it’s new and emerging styles, brewing talent or fresh releases from established players, it’s an awesome feast of exploration. So when the invitation came through to attend the sixth annual Beer Geek Madness Festival in Wrocław, Poland, our initial thought was, “they have a craft beer geek festival in Wrocław?...why didn’t we know about this?... we have to go” and so we quickly accepted the invite and headed East. We arrive in Wrocław, the largest city in Western Poland to discover spring in full swing, it’s bright and the sun is out to play; a welcome break from the grey and gusty weather we’d come from in the UK. The festival organisers had kindly arranged a taxi to pick up us at the airport, we meet our driver at arrivals holding up the unmissable sign displaying the enchanting words “Beer Geek Madness”. Who wouldn’t want to jump in that taxi? Having limited knowledge of the craft beer scene in the city, we’re free from the weight of expectation (in a good way) and full of curiosity as we make the short 20-minute journey into Wrocław city centre. Having checked into our hotel, there’s only one thing on our mind...BEER! We head for Bar Targowa to our meet our fellow guests invited to this year’s Festival, consisting of eight international breweries traveling from Spain and Sweden. When we arrive at Targowa, our hosts Greg and Arletta from Browar Stu Mostów, have laid on a generous spread covering two tables, offering a delicious mixture of tapas-style nibbles and classics like homemade Pork schnitzel, coleslaw, and potatoes; not a bad way to break the ice and meet our fellow beer pilgrims! 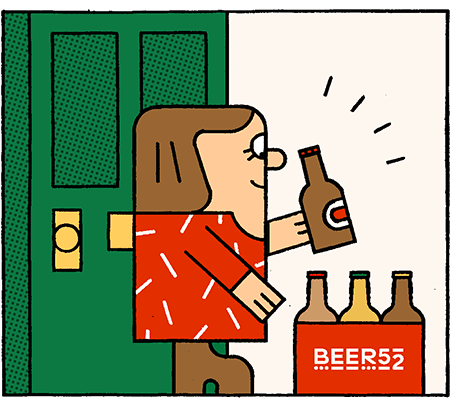 A quick scan through the beer menu surprises and delights, revealing everything from on-trend double dry-hopped DIPAs and milkshake IPAs to imperial stouts and even pilsners, many of them produced by Polish craft breweries we have never heard of before. We dive right in and order Misty, a 5.5% New England IPA from Trzech Kumpli. Big, juicy aroma and taste profile, smooth laid-back bitterness – wow, this is one hell of a beer. What a start, and a sign of things to come for our adventures at Beer Geek Madness the following day, we hope. Next day we wake up early to explore the city on foot, picturesquely situated on 12 beautiful islands connected by a staggering 112 bridges, Wrocław continues to take us by surprise with its stunning architecture, delicious food and welcoming locals. As the afternoon draws to a close we make our way to the main event, Beer Geek Madness. The impressive venue for the festival is Zaklęte Rewiry, an imposing red brick industrial style building located in the south east of the city. The lineup for this year’s festival includes 31 Polish breweries and eight breweries from abroad, offering a total of 91 different beers for one day only, over eight hours of intense Beer Geek Madness. Spain is the overarching theme for the international guest brewers, with a lineup including the phenomenal Garage Beer Co, Cerveses La Pirata, Naparbier and Edge Brewing, accompanied by the world-class Dugges, hailing from Sweden. Each having air freighted over super fresh kegs of their best beers for the local crowd to soak up on the night. Having no idea what to expect ahead of our travels, we are quickly overwhelmed by the quality and diversity of some of the beers on offer at the festival. One of the rules for brewers attending is that they have to release one new beer each, which has the locals queuing up in lines 50 people deep to get their hands on their favourite brewer’s new beers, confirming that FOMO is indeed alive and well in Wrocław. Working our way through (or getting lost in) the fascinating, multi-level venue, discovering previously unknown brewers (to us) pouring truly exceptional beers from taps and bars popping out of every nook and cranny in the building, we get a distinct feeling we are indeed in the midst of real Beer Geek Madness and we are loving it. In all honesty, this is like no other beer festival we ever had the pleasure of attending. Every room unearths something completely different, usually wild and interesting, not only in terms of craft beer and food but also the abundance of other activities happening throughout the festival. Punters enjoy live portrait drawings by local artists, barbers listening to pumping beats and dancing their way around their customers as they deliver slick haircuts below the stairs. There are voting stations where you elect your beer of the festival and, best of all, there is fantastic live music in the main hall. It is intense and wonderful. Naturally, we grab the new ‘Grapefruit and Mandarin DDH DIPA’ from Browar Stu Mostów and head onto the dance floor to enjoy the live Flamenco performance happening on stage. Closely followed by a couple of fantastic beers from PINTA including new release ‘Sangriale’, which pair perfectly with the Spanish Ska band, Kumbia Mac, who take to the stage next, having flown in especially for the occasion. We wrap up our first ever Beer Geek Madness by voting for our favourite beers and awaiting the big announcement, winner of Beer Geek Choice 2018, at midnight. To our delight, it goes to Browar Widawa’s’- ‘fRISs freak’, Imperial Tropical Stout, 15% abv. The experience we had at Beer Geek Madness totally blew us away, not only in terms of the format of the festival, but also the hidden gems we uncovered from the Polish craft beer scene. So much so in fact, that we decide there and then that we must host this Polish-themed takeover month at Beer52 as soon as possible, to share the incredible beers we discovered and the story behind them with as many people as we can. We are already looking forward to returning to Wrocław next year for Beer Geek Madness 7 and we hope to see a few of you there too. Special thanks to Greg and Arletta from Browar Stu Mostów for the invite to the festival and turning us onto the great beers being brewed in your country.